Now that you’ve finished Part I of my three-part Managed Availability blog series, I will now go a bit deeper and provide some examples about the functionality and operability of Managed Availability. 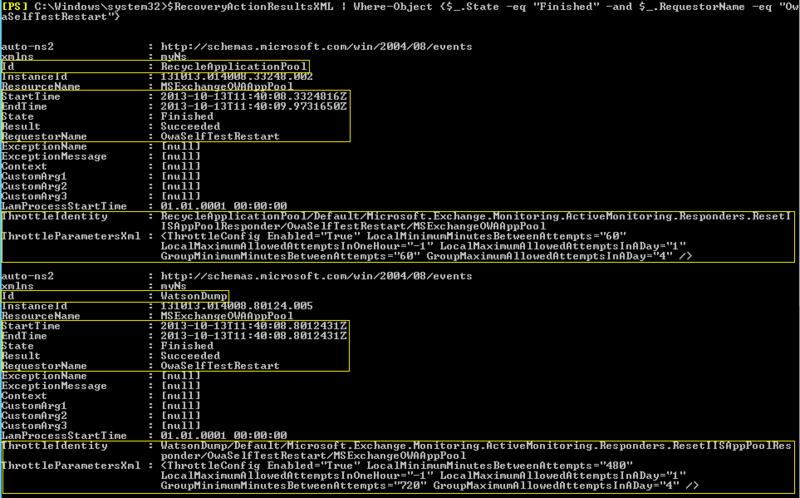 My virtual test lab contains a two-member DAG based on Windows Server 2012 and Exchange 2013 CU6. This cmdlet shows multiple HealthSets, which are Unhealthy. In this example, let’s take a look at the HealthSet Clustering, which has 5 Monitors. From the output above, we found that Validate HA health is not impacted by cluster related issues and therefore wants to fix it. Note: For reference, you can take a look at the Exchange 2013 Management Pack Health Sets: http://technet.microsoft.com/en-us/library/dn195892(v=exchg.150).aspx Important: this cmdlet is only available if your Exchange servers are configured for time zones UTC and UTC-. The cmdlet doesn’t work with time zones UTC+ (hopefully Microsoft will fix this issue in the near future). Result: the quorum resource “Cluster Group” is not online on server “xsrvmail2.“ Database Availability Group “E2K13-TAP” may not reachable or may have lost redundancy. Why could Managed Availability solve this issue not of itself? As you can see in the screenshot above, the appropriate Responder called ClusterGroupEscalate with the parameter Name, AlertMask, EscalationSubject, EscalationMessage, and UpdateTime. Remember: Escalate Responders writes an entry in the Event Viewer to inform an administrator. This means that any issues with the HealthSet Clustering cannot be recovered automatically through Managed Availability. 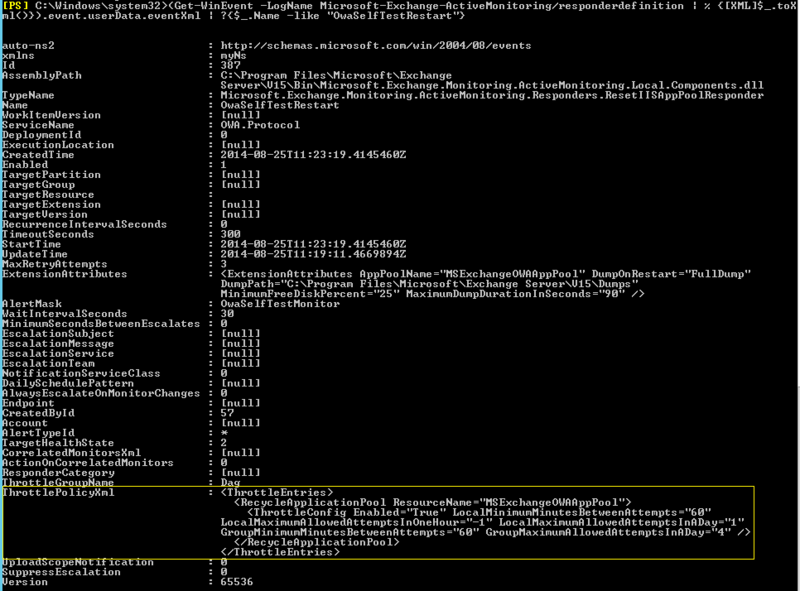 As you can see in the screenshot above, there are much more Responder types for the HealthSet Clustering. Next, you should take a look at the Microsoft-Exchange-ManagedAvailability/RecoveryActionResults crimson channel for entries. Event 500 indicates that a recovery action has begun, event 501 indicates that the action was taken has completed, and event 501 indicates that the action threw an error. 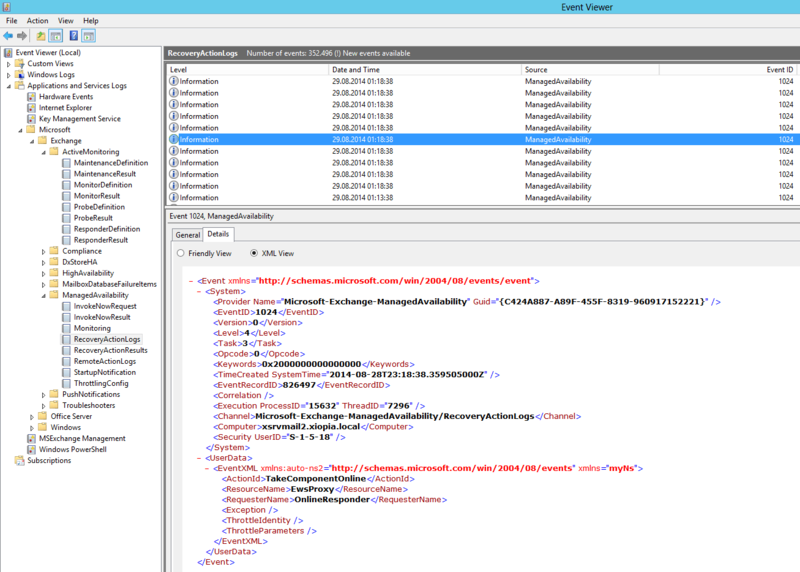 Note: you have a better overview if you go directly into the Event Viewer in the log name Microsoft-Exchange-ManagedAvailability/RecoveryActionResults. 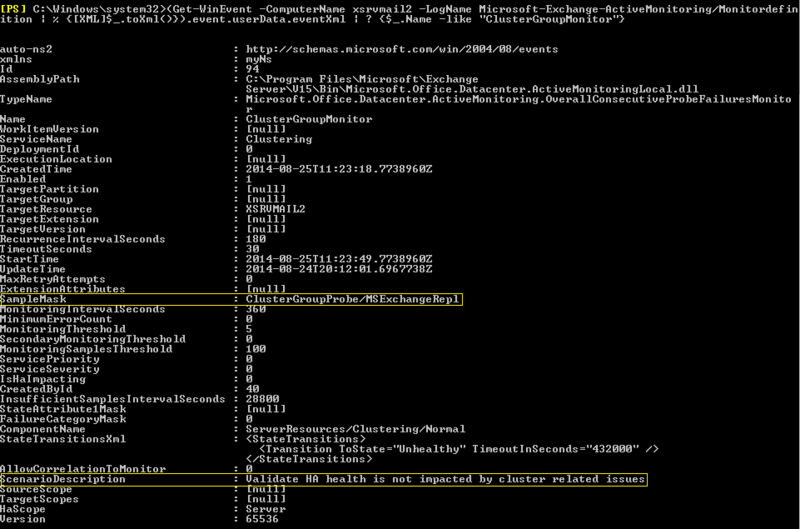 For specific troubleshooting, I prefer the Exchange Management Shell. -The second created parallel a Watson Dump because the MSExchangeOWAAppPool application crashed.